Updated: 26 Ramadan 1433H / 13 Aug 2012M, Is. 26 Jamadilawal 1433H / 18 Apr 2012M, Rabu. 25 Safar 1433H / 19 Jan 2012M, Khamis. My old Toshiba Satellite M100 laptop has met the end of its service life :(. Starting its service life in the place of the old laptop is a new Lenovo IdeaPad Z470 laptop. The switch from old to new laptop happened around the Ubuntu upgrade from Ubuntu 11.04 Natty Narwhal to Ubuntu 11.10 Oneiric Ocelot. The new laptop comes pre-installed with Windows 7. For reasons not-so-important-to-mention, the laptop has been setup to dual boot: Windows 7 or Ubuntu. i'm running Ubuntu 11.10 (64-bit). Problems with the touch-sensitive buttons (all the buttons in the volume button row) specific to this laptop. Problem isn't solved yet. Bluetooth is turned on automatically at start-up. i want it turned off. 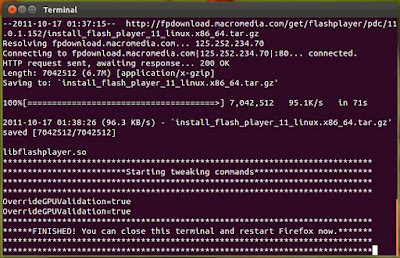 Below are the simple steps to solve the Flash problem with FireFox. 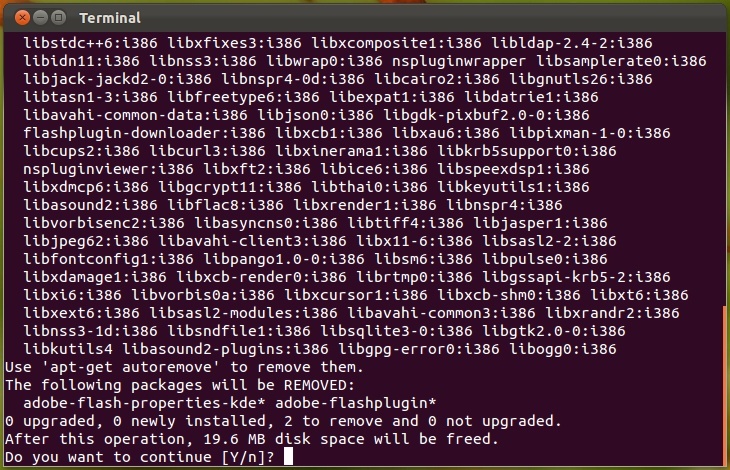 i took the solution from here, Re: Problems with flash player in Ubuntu 11.10 and refined the explanation. Update: 26 Ramadan 1433H / 13 Aug 2012M, Is. 1. Run your FireFox browser. 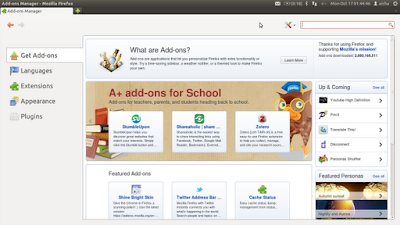 The Add-ons Manager tab will appear in the browser. See Pic 2. Pic 1 - Refer Step 2. Pic 2 - Refer Step 2. The Add-ons Manager tab in the FireFox browser. 3. In the Add-ons Manager tab, go to Get Add-ons tab. See Pic 2. Referring to Pic 3, type the term flash in the search field then press the Enter button to search for the Flash-Aid extension. The Search tab will automatically appear above the Get Add-ons tab. Look for the Flash-Aid extension in the search results. The current version at the time this post is written is Flash-Aid 2.2.1. Click the Install button to download the extension. Pic 3 - Refer Step 3. Searching for the Flash-Aid extension and downloading it. 4. After downloading is done, click the Restart now link (located beside the extension's name) to restart your FireFox browser then install the extension, see Pic 4. Fret not, any opened tabs will be reloaded after restarting your browser. Pic 4 - Refer Step 4. 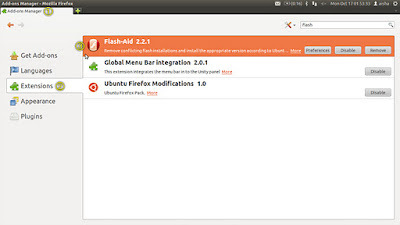 Restarting FireFox to install the Flash-Aid extension. 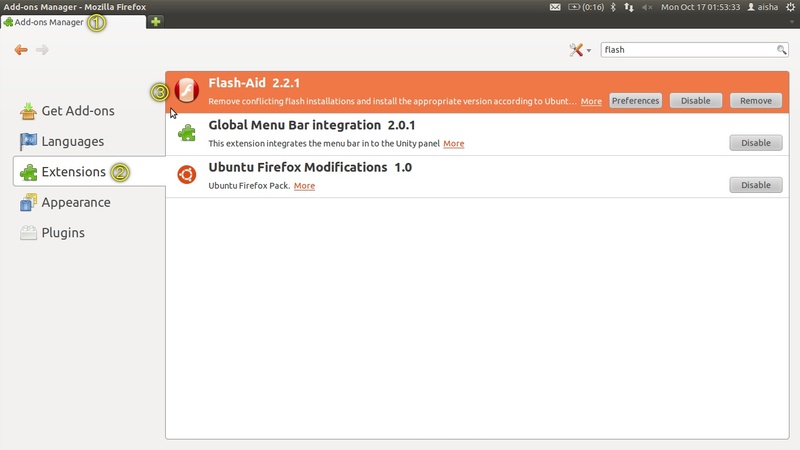 After restarting FireFox, to check whether the Flash-Aid extension is installed, go to the Extensions tab, see Pic 5. Satisfied, close the Add-ons Manager tab, there's no further need for it. Pic 5 - Refer Step 4. Checking for the Flash-Aid extension in the Extensions tab. 5. In your FireFox browser, notice the Flash-Aid button (see Pic 6) at the right-hand-most on the same row of the address bar. See Pic 7. Pic 6 - Refer Step 5. The Flash-Aid button. Pic 7 - Refer Step 5. Flash-Aid button position in my FireFox browser. Click-hold the Flash-Aid button. A pop-up menu appears. 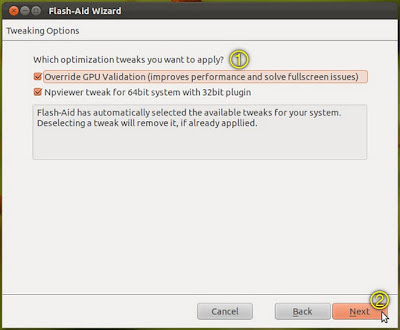 Choose Wizard Mode for aid to correct the flash errors. See Pic 8. 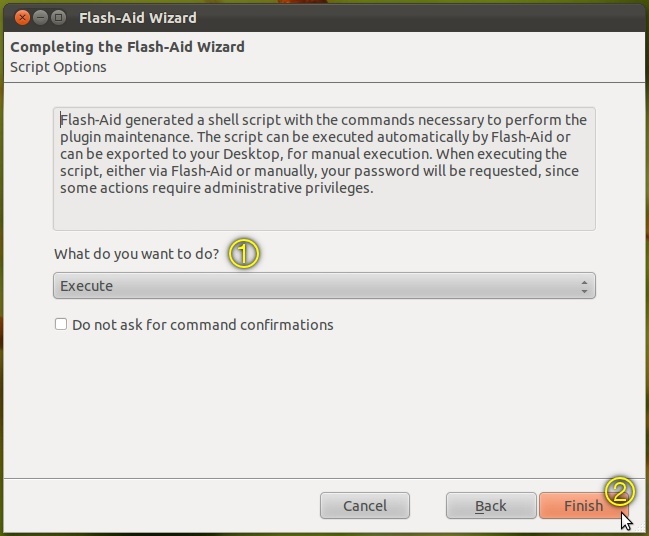 The Flash-Aid Wizard window appears, see Pic 9. Pic 8 - Refer Step 5. 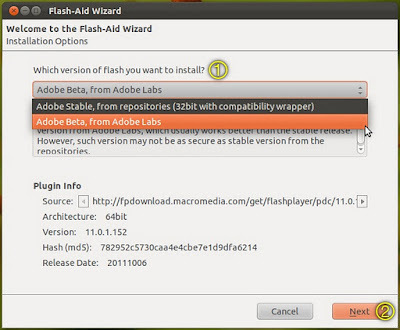 Which version of flash you want to install? Choose from the drop-down menu the version of flash you want to use depending on your architecture, then click the Next button. See Pic 9.
i chose "Adobe Beta, from Adobe Labs". Pic 9 - Refer Step 6. Which installed plugins you want to remove? Tick the box for the plugins you want to remove then click the Next button. See Pic 10.
i left all the boxes ticked and simply clicked the Next button. Pic 10 - Refer Step 7. Which optimization tweaks you want to apply? Tick the box for the tweaks you want to apply then click the Next button. See Pic 11. Pic 11 - Refer Step 8. Choose what you want to do then click the Finish button. See Pic 12.
i left the option at Execute and simply clicked the Finish button. Pic 12 - Refer Step 9. The Flash-Aid Wizard window will disappear and a Terminal window will appear. See Pic 13. Pic 13 - Refer Step 9. 10. 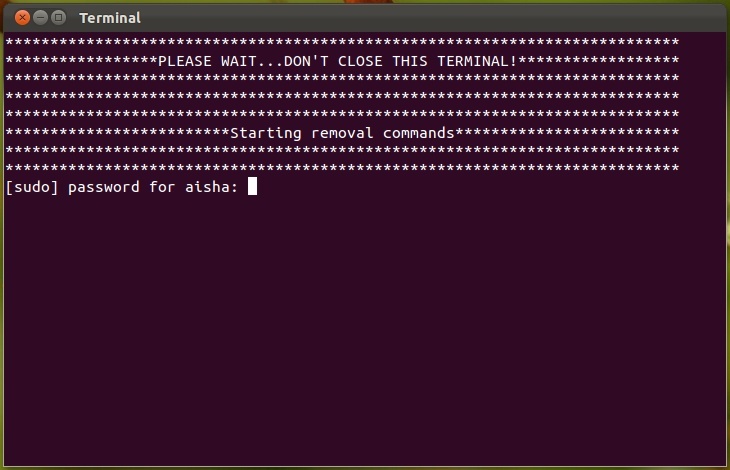 In the Terminal, follow the commands that appear. If requested, type in your password then press the Enter button. See Pic 13. Type in y then press the Enter button. See Pic 14. Pic 14 - Refer Step 10. 11. 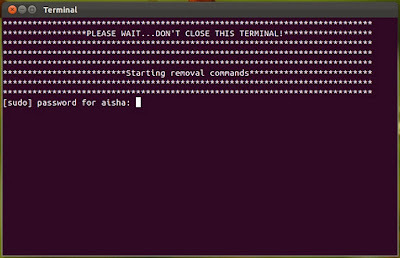 When the process in the Terminal has finished, see Pic 15; close the Terminal, then restart your FireFox browser. Pic 15 - Refer Step 11. 12. 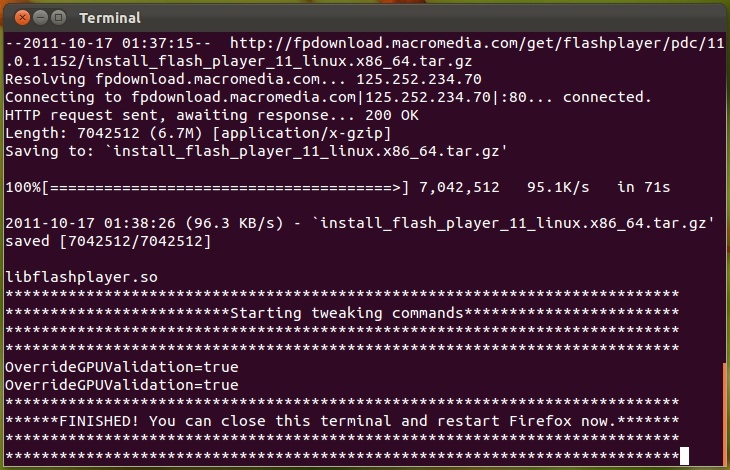 Try going to a website with flash contents to check if your flash has been installed correctly. 13. 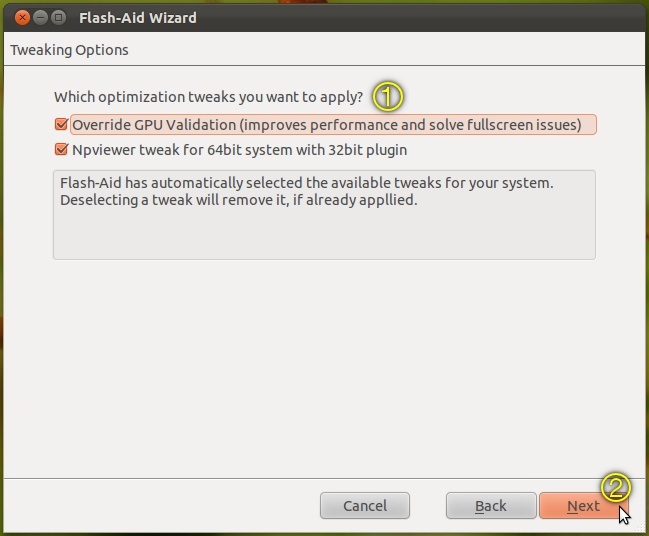 Simply go to the Flash-Aid icon (see Pic 6), click-hold, then select Check Update. See Pic 16. A notification will appear to inform about any update, see Pic 17. If there is a new update, choose the update method (Wizard Mode / Quick Mode / Advance Mode) you are comfortable with. i'm sure by now you have a preferred method :). Pic 16 - Refer Step 13. Checking for update. Pic 17 - Refer Step 13. Update notification. Update available. This this just my opinion: Even if there is an update, if your flash is working OK, just leave it be -- Don't update. It's not broken, so why fix? Thank you man :) helped out my chromium too. I did this and just performed the update. One sites with webcam access, I get the popup asking for permissions and then the entire browser window locks up and I can't click anything on the Flash popup message. This is really irritating. i'm no expert so i'm not sure what's the cause of your problem: browser settings maybe? flash maybe? the pop-up itself maybe? etc. Because i thought only my browsers were problematic so i don't quite remember exactly what i did in order to share how i solved my flash problem. 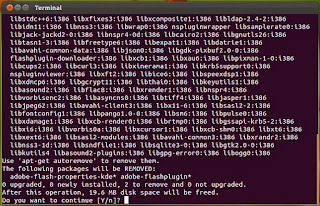 Basically what i did was uninstall/re-install flash many times by trying all the modes Flash-Aid offered: Wizard Mode / Quick Mode / Advanced Mode. i'm just guessing since i don't exactly remember; i think i finally solved my problem by choosing Quick Mode > Install stable flash and followed the instructions, including apt-get autoremove. This strait up helped me with my problem. Thank you. Thanks a lot, I hope my firefox in "stable"
thx, solved the problem that bother me for 1 month. all the best from Romania. Alhamdulillah. Glad your problem is solved. You're welcome & Thank you. Thank you. i've mentioned your suggestion in the post.